Aston Barclay plc and cap hpi have teamed up to develop a new mobile and tablet-based inspection app that provides enhanced reporting and appraisal for Aston Barclay’s customers. The new multi-platform app will enhance the efficiency of inspections and appraisals at Aston Barclay’s four sites across the UK, providing a quicker, modernised inspection and streamlined remarketing process. 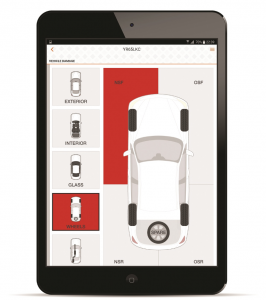 The app will simultaneously provide grading based on the National Association of Motor Auctions (NAMA) and Aston Barclay standards, alongside any other bespoke matrices, requested by fleet customers. Inspection reports and images are uploaded from the app to sales catalogues on the group’s website, as well as seller reports via the IMS reporting suite, along with all other digital services, enabling fleet and leasing customers access to inspection data, images and sale reports, all through a single log-in, wherever they are, giving them total oversight of their auction activity from collection to sale. The introduction of the app has led to further developments of a new Damage Portal, which allows fleet customers to amend total estimates when recharging their clients for end-of-contract damage fees. This has also allowed inspection reports to be re-designed, bringing them in line with Aston Barclay’s house style, whilst providing a simple view of the overall condition of a vehicle. “Our new inspection and appraisal app is the logical next step of Aston Barclay Group investment. Further enhancing our comprehensive inspections service ensures the overall de-fleeting process and inspection of vehicles remains quick and efficient,” said David Scarborough, commercial director at Aston Barclay. The app also allows Aston Barclay to lay the foundations for off-site collection and inspection services, using their recently enhanced transport services. “The new app seamlessly blends the latest technology with industry-leading data to provide a solution that now saves about 100 hours every week at every site,” added Christopher Wright, sales director at cap hpi.